Properly adjust your drill bit’s depth – set up your drill’s travel so that it just barely kisses the surface of your wooden drill blocks to avoid flaring the tip of your bits. Use clean wood drill blocks – this will ensure that you get a perfectly clean hole all the way through your stack. Sharpen drill bits regularly – keeping the tips of your bits from becoming dull will reduce friction and keep your workflow moving along. It is recommended that you sharpen your bits as often as before staring every new job. Keep bits clear of paper chips – using a chip clearer to free any paper chads in your bits will help to reduce friction and heat and will ultimately prolong your bit life. Place scrap stock or chipboard under your stacks – acting as a buffer, these will ensure a clean, perfect hole on the last sheets of your stacks being drilled. Keep bits well lubricated – this is crucial to reducing friction, burning of your sheets and helps the bit travel more smoothly through the stack. Apply drill bit lubricant to the entire shaft. A little in the tip of the bit can go a long way toward helping the waste chips exit the bit. So there you have it, 6 basic steps that, if performed regularly will help you increase your finishing productivity and will help keep you from replacing dulled, damaged drill bits so often. Do you have any useful tips for drilling? Share your thoughts with us – we might just feature your tips on our Facebook & Twitter pages. As always, please feel free to send your binding or finishing questions to me via email, we’d love to hear from you and are here to help. You can also learn more at www.cfsbinds.com. Dull bits are the leading cause of burned or discolored paper. Sharpening your bits daily takes just a few minutes and ensures that they will easily cut through your paper and even clear or vinyl covers. 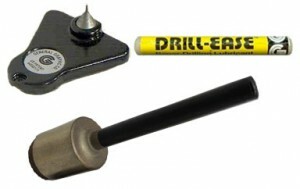 Challenge Machinery, manufacturers of the HandyDrill and the EH-3C paper drill presses, recommends that bits be sharpened before every new job. Mostpaper drill sharpeners require little-to-no pressure in order to properly sharpen or hone the tip of a hollow drill bit. Excessive force will cause the tip of the bit to flare out like a bad pair of bell-bottom jeans – making for a larger and ragged hole, not to mention increased friction. This simple adjustment achieves maximum productivity and reduces waste or damage to the bottom sheets in your stacks. Most paper drill presses have an adjustment that can raise or lower just how far the bit pushes down – some models move the drill head, while others have a table height adjustment. Proper depth is reached when the bit just barely kisses into the wooden drill block (drill strip) below your paper stacks. Take special care to make only minor adjustments as excessive depth can damage the delicately thin tips of your bits. Ample bit lubrication will help to reduce friction and allow for smoother, quicker drilling and allows the waste chips to flow more easily out of the hollow bits. 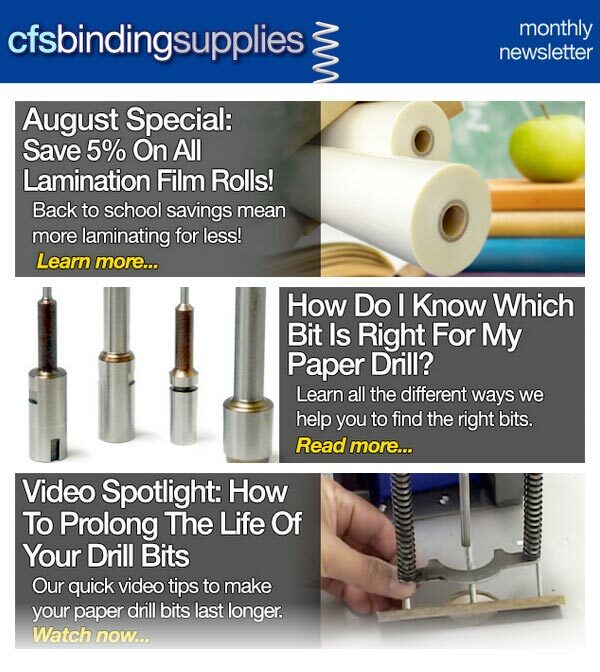 Paper drill bit lubricants are available in two forms: wax sticks (like Drill-Ease) and liquid. Both have oils in them, so be sure to drill through some scrap stock to avoid staining your documents from excessive oil. The drill shaft (portion that punches the paper) should be lubricated on the outside as well as the tip, ensuring that some gets up inside the bit. Placing some scrap stock or chipboard under your paper stacks will make certain that your bottom sheets come out cleanly punched. Some argue that occasional rough fibers in chipboard may prematurely wear down hollow paper bits, however regular sharpening and following these other tips will make that a moot point. Sometimes paper chips can become lodged inside the hollow bits and once done drilling, the paper drill bit metal slightly changes as it cools. Using a chip clearer cleans all of the waste chips out of your bits leaving you ready to sharpen and lubricate when the next drilling job comes up. 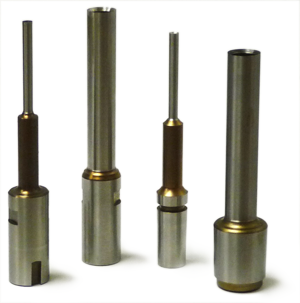 These few simple steps when performed regularly will actually improve your finishing productivity, reduce downtime and will save you money on replacing paper drill bits.